The great Peter Drucker once said, “Innovation is the specific instrument of entrepreneurship. The act that endows resources with a new capacity to create wealth.” The story of Liset and Ximena Contreras embodies this quote and much more. As the number one exporter of Brazil nuts with 35 percent of the total market share, Bolivia cultivates approximately 20,000 tons of this product a year. Only 0.8 percent of the Brazil nuts are exported with their shell; the rest are cracked and their nutshells are discarded as waste. Liset, a 25-year-old Bolivian industrial engineer, came up with the idea of using discarded nutshells as a source of biofuel. The nutshell waste is often produced in remote areas of the Amazon, and much of it is dumped in the Beni River, where it ferments and attracts mosquitoes with diseases like dengue fever. As Liset was researching this problem, she discovered that the nutshells had a higher calorific value than wood pellets, making them a potential source of fuel. Together with her sister Ximena, Liset founded PelletBol, a company dedicated to finding new uses for waste materials. As their first project, Ximena and Liset developed a method to compress the Brazil nutshells into pellets. Pellets have an array of uses, the most common being food for livestock. Wooden pellets also are used as fuel for pellet-based heating machinery. Demand for pellets has grown in recent years because of rising fossil fuel costs and increasing awareness of global warming. In fact, biomass pellets are the most commercialized form of biomass in Europe, and it is expected that demand for biomass products will grow 44 percent between 2010 and 2020. PelletBol is the pioneer firm in this niche market in Bolivia. The company entered a TechnoServe business plan competition and was selected as a winner, allowing the company to receive one-on-one assistance from a specialized consultant for 10 months. PelletBol received $15,000 to invest in processing machinery thanks to the U.S. Agency for International Development, which provided cash awards to some business plan competition winner. TechnoServe also helped the Contreras sisters with their application to the Cartier Women’s Initiative Awards, an international business plan competition that aims to identify, support and encourage projects by women entrepreneurs. Liset and Ximena were chosen as finalists for Latin America, and later this week in Paris they will present their business plan to a panel for judging. For their presentation, TechnoServe helped connect the sisters with Concepción University in Chile in order to analyze the energy content of the nutshells. As the world's largest producer of shelled Brazil nuts, the Bolivian industry generates up to 100,000 jobs either directly or indirectly, and roughly 28,000 families depend on it for their income. The newfound use of Brazil nutshells will benefit impoverished communities in the Amazon region, where most of the Brazil nut trees are located. PelletBol obtains its shells through collectors and factories that process the product. The collectors make an average of $0.38 per kilogram. With an increased demand for nutshells, these men and women can sell their kilo at a price that is 7 percent higher. The main challenge that this young enterprise faces is the lack of pellet-based heating systems in their home country. PelletBol is pushing for the implementation and promotion of these systems in Bolivia and hopes to reach the levels that Chile, Argentina and Brazil have. Their first goal is to provide heating fuel to the plateau area of El Salar de Uyuni, where there are low temperatures year-round and no natural gas available for heating. PelletBol also is investigating new ways of profiting on other forms of renewable biomass such as olive stones and quail dung. How Much Do You Know About Agriculture and Climate Change? Smallholder farmers face increasing difficulty growing crops as a result of climate change. Despite this threat to their livelihoods, many techniques can help farmers improve their resilience in the face of climate-related challenges. 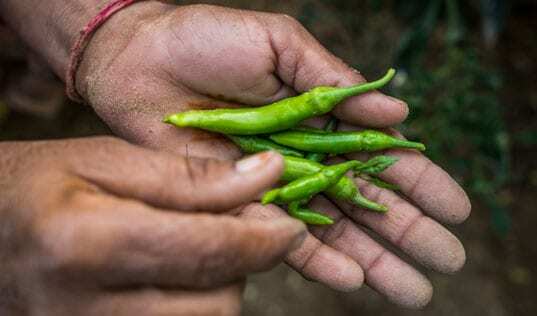 Take our quiz to see how much you know about the impact of climate change on small farmers, and the "climate-smart" approaches that can help. 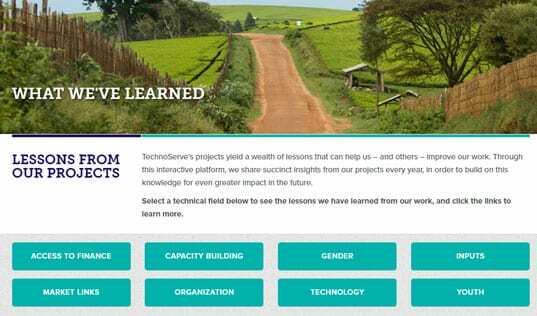 TechnoServe has developed a new interactive tool to share lessons from our work. Can Mushrooms Transform the Lives of Smallholder Farmers in India? In Madhya Pradesh, India, TechnoServe is partnering with Visa Inc. to develop microenterprise opportunities for women in agribusiness. 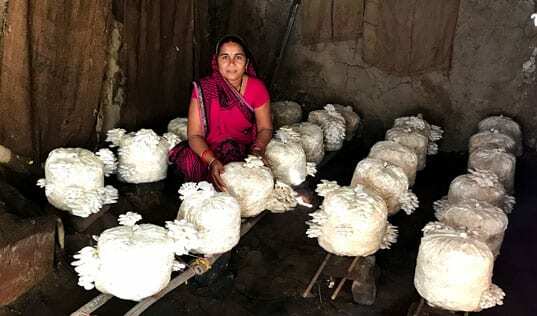 Following a two-day training workshop, women in Sonkhedi set up mushroom incubation units in their homes as a way to earn supplemental income for their families.